This is Dublin's oldest building, founded in 1038 by King Sitric of Dublin, then rebuilt in stone in 1169 by Strongbow, Earl of Permbroke, and restored in Gothic style in 1871. There is a crypt dating from 1172, and both buildings contain remarkable monuments, sculptures and other objects from over the centuries, including the embalmed heart of the Archbishop of Dublin (1180), punishment stocks, and a tomb oak carving from 1584. 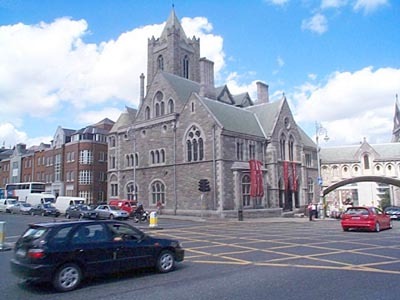 Across the road is Dublinia, an exhibition of Dublin's medieval history, and a few minutes walk away is The Viking Centre which has an extensive collection of Viking artifacts excavated from this area. The ‘Undercroft' is part of the original Viking fortress, and the ‘Record Tower' is part of the later 13th century Norman Castle. Dublin Castle has a long history as the seat of English rule in Ireland for seven centuries, and if you do pay the admission, you can visit the 19th century Chapel Royal and the State Apartments, now used for State functions. The Chester Beatty library, with its superb collection of 22,000 manuscripts from cultures all over the world, has moved to a purpose-built gallery, in the Clock Tower building. Facilities: restaurant, heritage centre, craft shop. Trinity College was resolutely Protestant until 1793, when Catholics were theoretically allowed in (although the Catholic Church banned its faithful from entering the infidel halls until 1970), and determinedly masculine until 1903, when women were first admitted. A medieval heritage centre which uses life-size reconstructions to bring history to life, and includes many artefacts from the nearby Viking excavations. You can climb the 17th century Tower for a view of Dublin, check out the punishment stocks and suits of armour, and cross the gothic style pedestrian bridge to Christ Church cathedral. Facilities: audio in 5 languages. Admission fee, pre-booking required for groups. Until a few years ago, Temple Bar was known more for its derelict buildings and badly-lit streets, but with the recent transformation (still in progress) it's now become Dublin's Cultural Quarter. There are several new cultural centres, all within a few minutes stroll of each other, many housed in new buildings of unique architectural design. New squares and re-built streets are full of cafes, restaurants and pubs; and on Saturdays, there's the Book Fair and the Food Market. Several music events take place in and around Temple Bar throughout the year, and in the summer there are extra events, including outdoor film screenings and children's entertainments. The area around the west end of Temple Bar has been extensively excavated, and the large collection of artefacts recovered from the excavations are now housed in this Viking Adventure centre, which interactively recreates life in the narrow streets of Viking ‘Dyflin' 1000 years ago. Ireland's largest Church, built in 1171, on the oldest Christian site in Dublin (St. Patrick is said to have baptised converts here), and also the first University in Ireland (from 1320). Don't miss: the West Tower houses the largest ringing peal of bells in Ireland, and the church organ is the most powerful organ in the country. Located in Dublin's newest restoration project at Smithfield Village, the 220ft. Chimney was recently restored and equipped with a glass observation tower. Great views on a clear day. The Chimney is next to the Jameson Distillery, and close to The National Museum at Collins Barracks which is linked to the other National Museums at Kildare Street by the Museum Link bus. Comprised of 2 houses, 85 -86 has recently been restored and is now considered one of the best examples of Georgian architecture and design. Cardinal Newman founded a Catholic University here in 1850, and James Joyce was a student here. Don't miss: the marvellous plasterwork by the Lafranchini brothers, and by Robert West. Next door is the University Church, with byzantine interior and Irish marble pulpit. A 10-minute walk away is Number Twenty Nine, at 29 Lr. Fitzwilliam Street, a restored house representing a typical home of the late 19th century. Restored house of the late 18th century, including examples of Irish craftwork of the period. One of Dublin's finest buildings, built 1781 - 1791 by James Gandon, it runs along the Liffey for 114 metres. It was gutted in the 1921 independence struggle and subsequently restored. Dwarfing New York's Central Park and London's Hampstead Heath, Phoenix Park is one of the largest city parks in the world. Along with gardens, lakes and 300 deer, there's hurling, cricket and football grounds, a motor-racing track and some fine 18th-century residences. Near the Parkgate St entrance is Europe's tallest obelisk, the 63m (206ft) Wellington Monument, a tribute to the Dublin-born Duke of Wellington. The People's Garden dating from 1864, the Victorian bandstand in the Hollow and Dublin Zoo are all nearby. On the park's southern edge is the derelict, 18th-century Magazine Fort. Granby Row, Parnell Square, Dublin 1. Life-size and life-like figures of famous Irish leaders, politicians, writers and musicians; includes a Children's World of Fairytale and Fantasy, Chamber of Horrors and Hall of Megastars. The main Bank of Ireland building housed the Irish Parliament until 1800: you can visit the Irish House of Lords chamber for free. There are guided tours on Tuesdays (10.30, 11.30, 13.45) only. Founded by Arthur Guinness in 1759, St James' Gate brews an astonishing 450 million litres of Guinness per year, which just manages to keep ahead of the 4 million pints per day consumed in Ireland alone.